There's very little I like more than sharing a festive drink with friends at Christmas time. Make your friends merry with one of these holiday-themed cocktails. Enjoy! Pour 1/4 cup cranberry juice into a shallow bowl. Pour 3 Tbsp. sugar onto a plate. 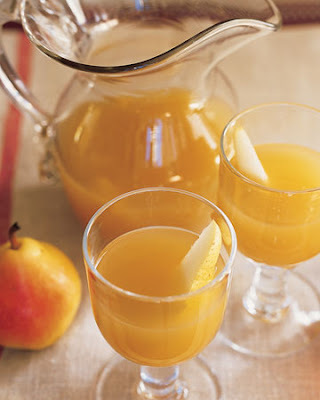 Dip rims of 4 to 6 widemouthed glasses into juice, then sugar. Set glasses aside. Reserve 12 cranberries. 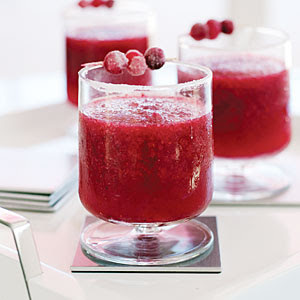 In a blender, mix the remaining cranberries, cranberry juice, and sugar, the lime juice, tequila, Cointreau and ice until smooth & slushy. If necessary, blend in 2 batches, then mix together. Divide among glasses and garnish with reserved berries, skewered 3 at-at-time, on toothpicks. Serves 4 to 6. Heat milk, sugar, and vanilla bean and seeds in a medium saucepan over medium-high heat, whisking until sugar has dissolved. Whisk yolks in a large bowl. 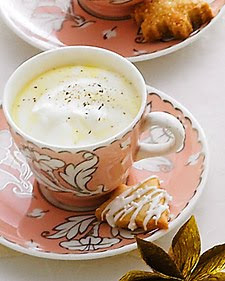 Pour hot milk mixture into yolks in a slow, steady stream, whisking. Return milk-yolk mixture to pan, and cook over medium-low heat, whisking often, until thick enough to coat the back of a spoon, about 20 minutes (do not let simmer). Pour through a fine sieve into a bowl; discard bean. Whisk in cream, bourbon, and rum. Let cool completely. Cover with plastic wrap, and refrigerate until cold, about 1 hour (up to 1 day). Serve sprinkled with nutmeg. 2 tablespoons brandy (optional), or to taste. Whisk together cornstarch and 2 tablespoons milk. Bring water to a boil in a 2-quart heavy saucepan, then reduce heat to moderately low and add chopped chocolate and a pinch of salt, whisking until smooth. Add cream and remaining milk (1 1/4 cups plus 2 tablespoons) and increase heat to moderate, then cook, whisking occasionally, until mixture is smooth and heated through. 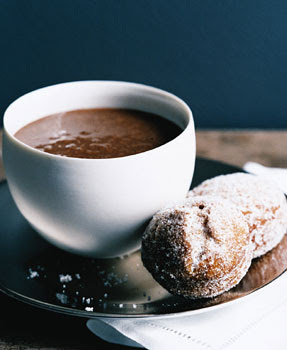 Taste; for a deeper chocolate flavor, whisk in cocoa. Whisk cornstarch mixture, then add half to chocolate mixture and simmer, whisking, until slightly thickened, about 2 minutes. Add brandy (if using) and remaining cornstarch mixture to thicken if desired, then simmer, whisking, 1 minute. Ooh, the Cranberry Margarita sounds delish. Great idea for a post!